This pedal produces intense drive while retaining high definition. “1”’s gain ranges from medium to very heavy distortion. The amount can be easily controlled via the volume control on your guitar. (Input impedance is set to facilitate this, and is somewhat negated if a buffer or buffered effect is used ahead of “1”.) 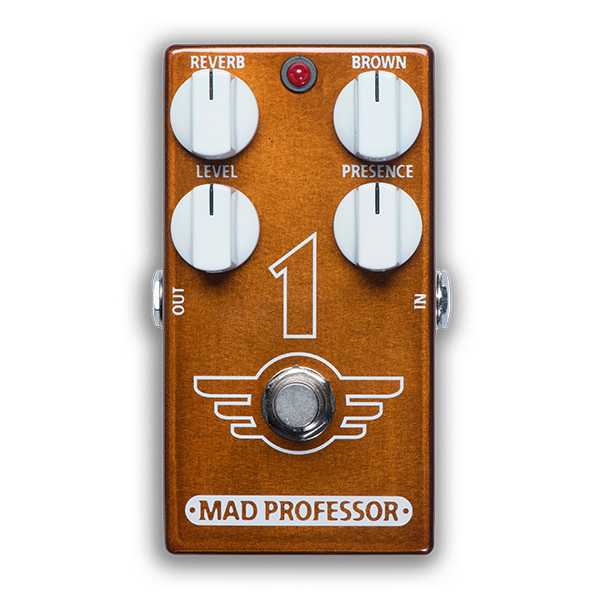 The Brown knob controls the amount and harmonic overtones of the distortion. Getting the exact tonal quality is the key to this legendary sound and “1”’s Brown and Presence controls help it appropriately interface with a wide variety of pickups and amplifiers. “1”’s built in Reverb circuit with a Level control for setting the ambiance. The sound is modeled after the studio reverb found on classic recordings from the 80’s. The decay time is preset so as not to mess the rhythm of your playing. The present decay time and tone can be modified with trimmers inside the pedal. CONTROLS VOLUME: Sets the output level of pedal. Brown: Controls the distortion and the sizzling highs. Presence: Adjusts frequencies similar to the Presence control on an amplifier. Reverb: Sets the “wet” level of the Reverb Mad Professor “1” ELECTRICAL SPECIFICATIONS Current draw: 82mA at 9VDC (external power recommended) Input impedance: 200K Output impedance: 25K Voltage range: 8-12Vs Power requirements: 6F22 9V battery or DC eliminator 2.1 mm plug center negative and positive sleeve. POWER REQUIREMENTS 6F22 9V battery or DC eliminator 2.1 mm plug center negative and positive sleeve.